AFC offers the chance to win goodies such as a season ticket. Alvechurch FC needs a new mascot! The club is inviting design ideas from boys and girls aged under 13, with the five best designs shortlisted and voted on by the public on social media. 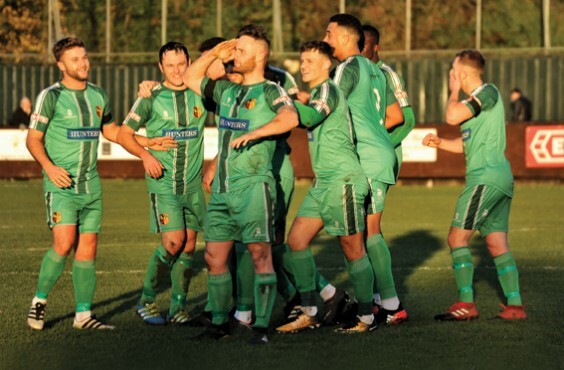 Alvechurch are still riding high in the league, climbing to fifth as we went to press thanks to wins against Barwell, St Ives Town and Bedworth. However, it’s been a different story in their cup campaigns, with the club crashing out of the remaining two competitions. First was the JW Hunt Cup defeat at the hands of Bilston Town. ’Church’s line-up featured seven players aged 19 or younger (including 16-year-old Ben Cassidy) and it proved to be boys against men, with AFC putting up little fight and only pulling two late consolation goals back from 5–0 down. After 66 minutes Alvechurch legend and assistant coach Keith Rostill came on, looking for the two goals that would take the club’s all-time leading scorer to the 250 landmark his career deserved, but it wasn’t to be. Three days later AFC faced Stratford Town – the team who had dumped them out of the League Cup – at home in the FA Trophy qualifying round, ending in a tight 1–1 draw. The replay saw Stratford totally dominate the first half to lead 3–0 at the break. Despite a better second half, ’Church, feeling the absence of both Mitch Botfield and Aaron Lloyd, were unable to breach the Stratford defence. AFC were hoping for better luck as they prepared to meet Stratford yet again – this time in the league – on November 27. * The club would like to welcome Tim Delaney to Lye Meadow as football operations manager. Tim joins after a successful spell at National League side Solihull Moors and brings a wealth of experience. Forward Yusifu Ceesay and centre-back Ashley Carter, who both played a major role last season, have returned to AFC. Yusifu attracted the interest of several clubs before signing for Football League side Blackpool, and has now been loaned to ’Church on an initial month’s deal. Ashley joined National League North side Nuneaton Borough at the end of last season, where he was a constant starter, but after discussions between the two clubs he will be back in an AFC shirt once more. However, recent signing Trea Bertie has returned to Racing Club Warwick. Congratulations to central midfield player Mitch Botfield for winning the Player of the Month award for October. Mitch played a significant part in the league matches with his creativity and vision, scoring three goals in consecutive matches. The directors, management and players would like to wish all supporters a Merry Christmas and Happy New Year!